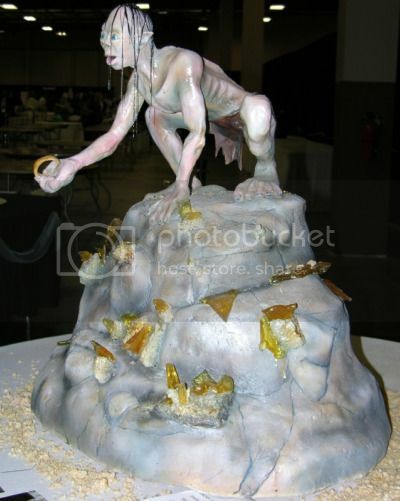 And by “goodness”, I mean fugging fugg-tacular cake artistry in the form of this Lord of the Rings Gollum cake by Brian Stevens of Crazy Cakes. Talent scouts from the TLC network saw Brian’s work at the show and asked him to appear on an upcoming episode of “Ultimate Cake Off,” one of their 17 cake-themed shows. Which means that we can fairly assume that the scouts from TLC have at least 1/6th of my impeccably-good taste. That is amazing!! The opposite of appetizing though. 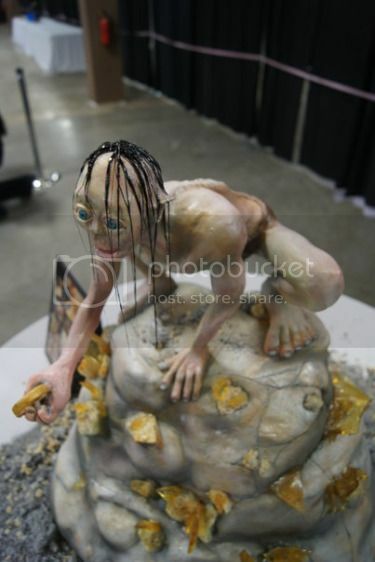 I imagine Gollum tastes like a combo of sweat, dirt, mildew, old socks, seaweed slime, and hate.